When this is your first view of a property as you walk across the verandah to check in, you know you are going to have high expectations. 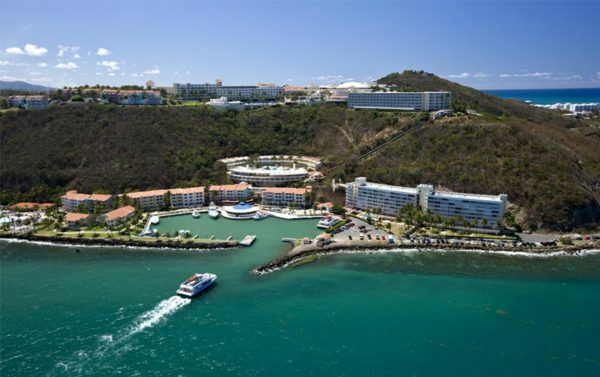 The El Conquistador Resort in Puerto Rico is a twenty-something year old resort that has just had an incredible, multi-million dollar facelift, and has been taken over by the luxury Waldorf Astoria group. Besides its luxurious, snazzy new look the resort has one feature that I love the best, which has been there from the beginning. 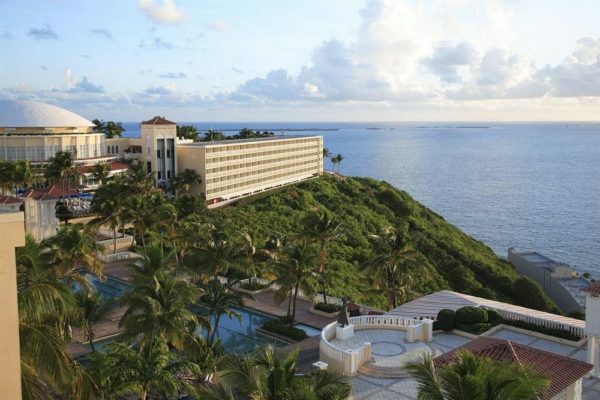 The “El Con,” as it’s known, is perched atop a 300-foot cliff overlooking the crystal-blue waters of the Caribbean Sea. On the aptly-named Island of Enchantment, this peaceful retreat is on a quiet end of Puerto Rico with some of the most stunning scenery that the U.S. island territory has to offer. To get down to the shoreline and marina, guests ride a cool cable car that plies its way up and down the cliffside all day long. Guest reactions to the cable car vary; during my stay there was a girl afraid of heights who was clearly nervous to be on it, and kids whose idea of a joyride was to take the cable car up and down like they were at Six Flags. At the bottom of the cliff is the marina filled with private and charter boats, as well as the public ferry that can take you across to the El Con’s private island, Palomino Island. Spending a day or a few hours on Palomino is one of the highlights of this resort; the beach and snorkeling are terrific, there is a great little restaurant and bar, and iguanas roam freely among the beach-going guests. At the base of the resort is also a restaurant and the Coqui Water Park, a big hit with the afore-mentioned kids. Although I have to say that I saw more than one adult zipping down the water slides with gleeful abandon. If that isn’t enough to keep you occupied, there is an 18-hole Arthur Mills golf course, a casino, and the exquisite Golden Door spa. Back in the resort, the rooms and private villas are simply beautiful. From garden and ocean view rooms to two-bedroom suites and fully-equipped large villas, the El Con has something for friends, families and those seeking a romantic get-away. In fact, the resort has a thriving wedding business that sees hundreds of couples tie the knot here every year.